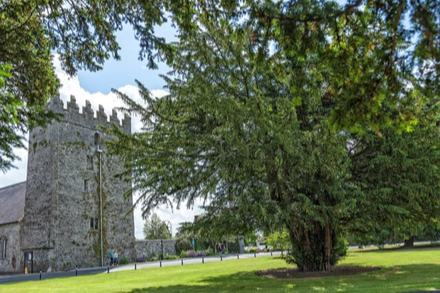 Celbridge, set in the Liffey Valley and nestled between the linked, designed landscapes of Castletown, Donaghcumper and St Wolstan's, is steeped in history. 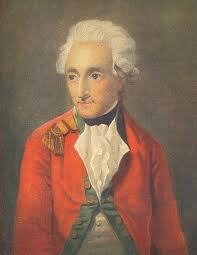 Its ties to the Conollys of Castletown, Arthur Guinness, Henry Grattan and Jonathan Swift are renowned. There are several interesting local historic sites to visit. Designed by Italian architect Alessandro Galilei and Edward Lovett Pearce, Castletown is Ireland's finest eighteenth-century mansion. 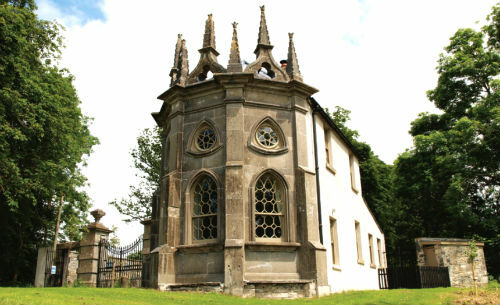 It was built in the 1720s for the Speaker of the Irish Parliament, William Conolly, a Williamite, and his wife Katherine, on the former lands of the Dongan family who had taken the losing Jacobite side in the war of the 1690s. The bell tower of their medieval castle survives and is located close by. 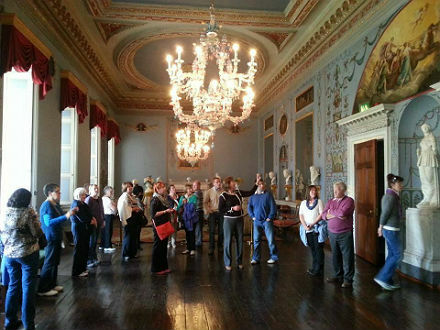 Castletown’s stunning interior decoration, furniture and paintings can be viewed on one-hour guided tours telling the near 300-year story of the house and its people. Visitors can relax and dine in the Courtyard Café. Conference, banqueting and exhibition facilities are available at the Event and Conference Centre in the East Wing. Lady Louisa Conolly (1743-1821), the wife of Tom Conolly, grand-nephew of Speaker William, came to the house in 1759. She loved Castletown. Under her direction many improvements were made including tree-planting, bridges, a lake, lodges, a bathing house and a temple. 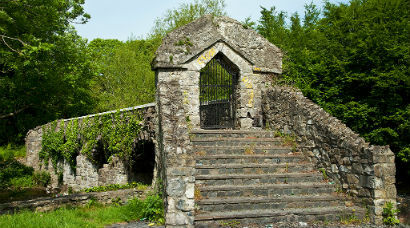 Such intriguing features as the Ice House, the Bathing House and Mrs Siddon’s Temple can still be seen in the demesne. Today the great house and demesne lands are owned by the Irish people under the management of the Office of Public Works which is restoring the house and the eighteenth- century designed landscape to its former glory. From Castletown House, a path to the south-east leads to the Batty Langley gate lodge. 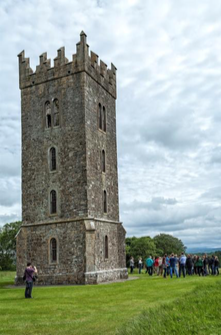 This unusual, charming building can be rented from the Irish Landmark Trust. Turning upstream along the river bank the ruin of St Wolstan’s Abbey comes into view across the Liffey. Founded in 1203, one of the largest abbeys in Ireland, and the first Irish monastery to be suppressed by Henry VIII in 1536, it was named after the last Saxon bishop in England, St Wolstan. He is said to be the patron saint of vegetarians and dieters. St Wolstan’s feast is celebrated on January 19th, a better date to begin new year resolutions perhaps! The demesne house on the site was home to St Wolstan’s secondary school until its move to the Clane Road in 1999. 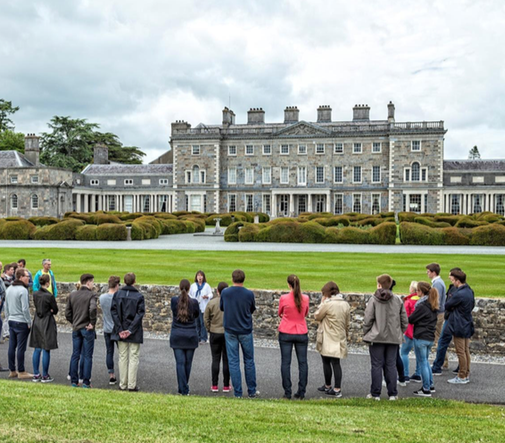 The Castletown parklands bordered by the river Liffey extend to over 120 acres and offer a rich variety of settings from the lawns of the great house to woodland and riverside walks with interesting features and structures. A map is available at Castletown House reception highlighting riverside walks and points of interest such as gate lodges, bridges, the temple, ice-house and ornamental lake with wildlife. The beautiful restored parklands and river walks are open every day and entry is free. For further information, telephone: 01-628 8252. 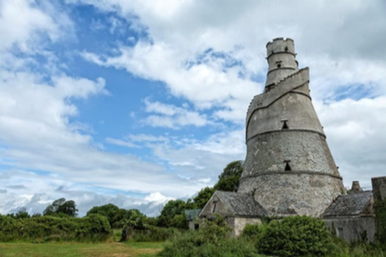 Two other unique structures, located outside Castletown, but designed to be seen from the house, are the Conolly Folly, built to provide much-needed employment in the famine of 1740-41, and the Wonderful Barn 1743, which served as a grain store. 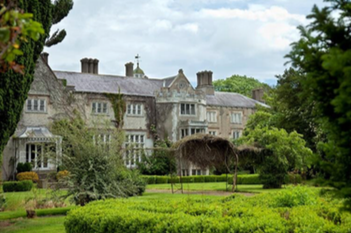 From the avenue, another of Celbridge’s important houses can be seen: Donaghcumper, former residence of the Kirkpatrick family one of whom played a significant diplomatic role during World War II and its aftermath. Castletown Demesne has been awarded the Green Flag Award 2017/2018 by An Taisce. Castletown also received a special Pollinator Award from Biodiversity Ireland's All Ireland Pollinator Plan, for parks which make a specific effort to support the local pollinating insect populations, or to promote their importance. Come and enjoy this wonderful natural environment. 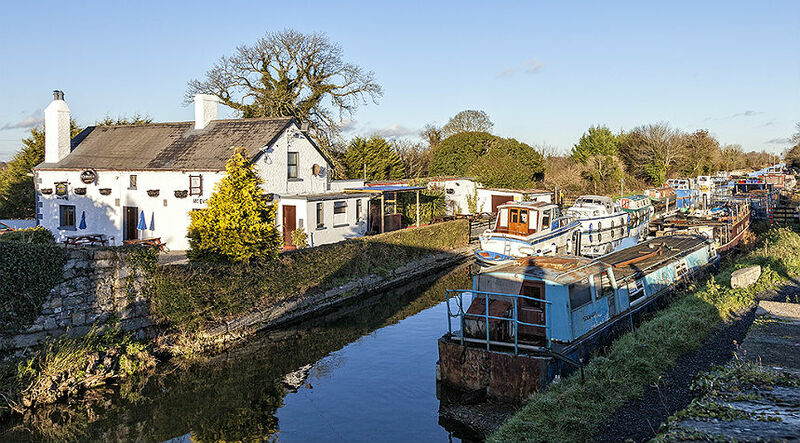 The Grand Canal linking Dublin to the Shannon passes through County Kildare near Celbridge, and offers miles of towpath for walking and cycling. This section of the Canal provides magnificent views of the Hill of Lyons, the venue for a famous duel in which the ‘Liberator’, Daniel O’Connell, the great leader of the Irish people, killed John D’Esterre in 1815. Bordering the canal is the 1,200 acre estate of Lyons: its great Georgian house, completed in 1797, can be considered among Ireland’s finest. 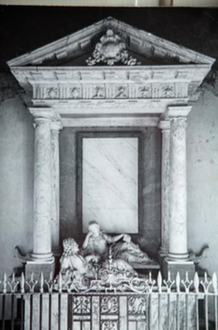 Valentine Lawless, 2nd Baron Cloncurry, spent £200,000 on its renovation in the early 1800s: this included the importation of some Roman antiquities. In 1996 the house, gardens and outbuildings were carefully restored by Ryanair founder Tony Ryan at a reported cost of some £80 million. The restored ‘Village at Lyons’ situated on the demesne by the banks of the Grand Canal is a real gem and features a high quality restaurant. See: cliffatlyons.ie..
To check opening times phone 01-630 3500. 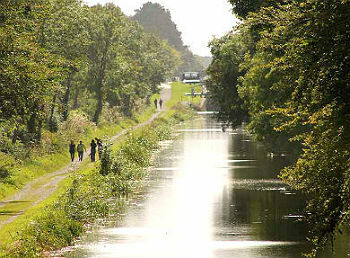 This section of the canal is part of the Arthur’s Way heritage route, close to the Guinness resting place at Oughterard. A fantastic amenity for cycling and walking. Plans are in place to make this a Greenway route, all the way from Dublin to the Shannon. Arthur Guinness, founder of the famous Guinness brewery at Saint James’s Gate in Dublin, was born at Celbridge in 1725 and lived there for 30 years. 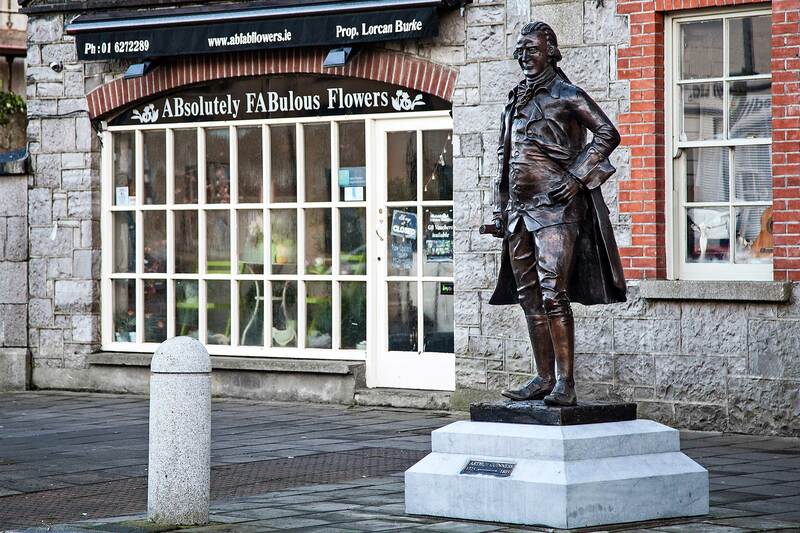 The inventor of probably the world’s greatest beer, and Ireland’s most famous export, is commemorated by a life-size bronze sculpture in the heart of the town. ‘The Duck’ and ‘The Village Inn’ pubs on the main street mark the site where Arthur was born. Here, at the birthplace of Arthur Guinness, visitors can learn to pour the perfect pint of Guinness stout, an experience not to be missed. Details of a heritage route tracing Arthur’s early years can be found at www.arthursway.ie. 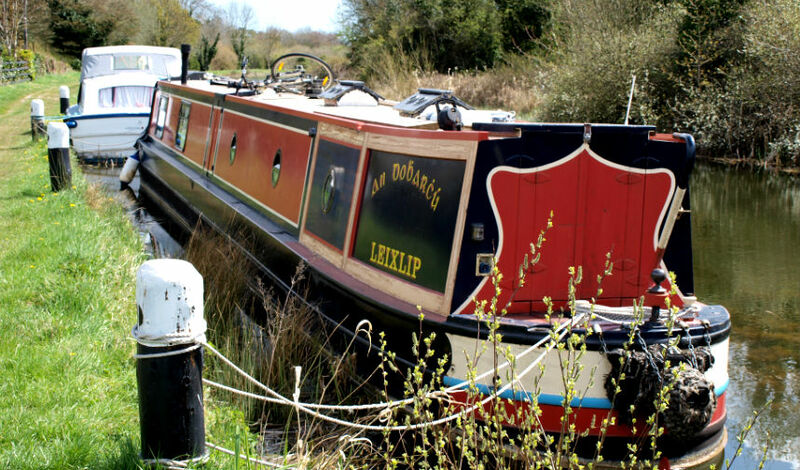 The 'Arthur’s Way' trail leads from nearby Leixlip, site of his early Guinness brewery, through his Celbridge birthplace, to the Grand Canal, for many decades a transport route for the famous 'black stuff', and onwards to his resting place in the nearby churchyard of Oughterard. 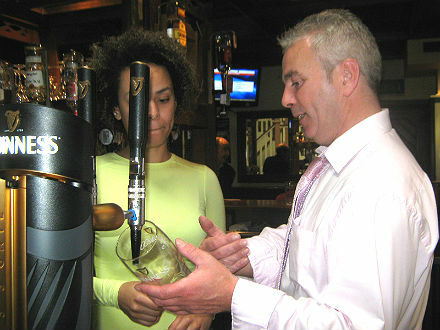 Arthur Guinness died in 1803 at the age of 78. 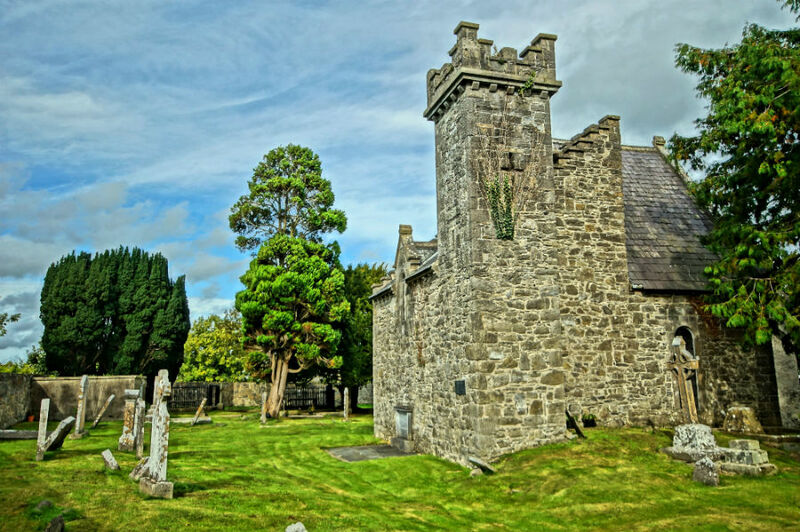 The master brewer and pioneer of enterprise now lies in a stone-walled hillside churchyard, just 15 minutes from Celbridge, in the shade of an ancient round tower. This Early Christian monastic site is where Saint Bríga (Brigid) founded a monastery in the 6th century. The early Irish manuscripts, or Annals, record that Viking marauders under Sitric Silkenbeard burnt the monastery down in 995. Now a very peaceful place in a rural setting of outstanding natural beauty offering wonderful views over the plain of Kildare, this is the final stage of ‘Arthur’s Way’. 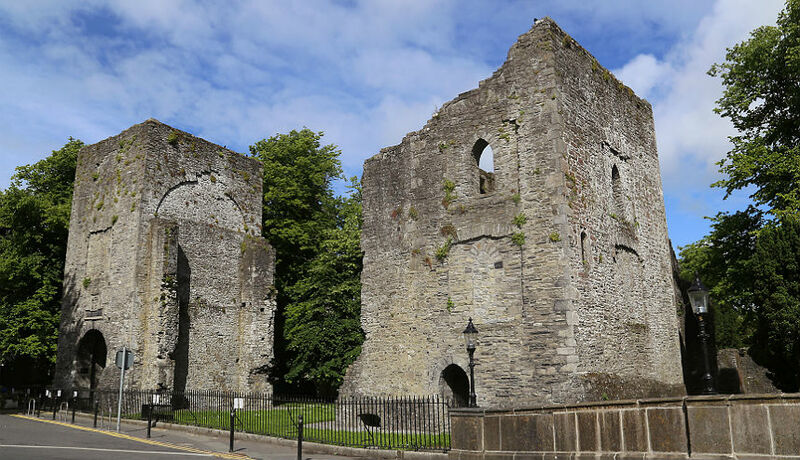 This heritage trail traces Arthur’s life from Leixlip, his first Guinness brewery site, through his Celbridge birthplace to the Grand Canal, and onwards to his resting place at Oughterard, with his mother’s people, the Reads. 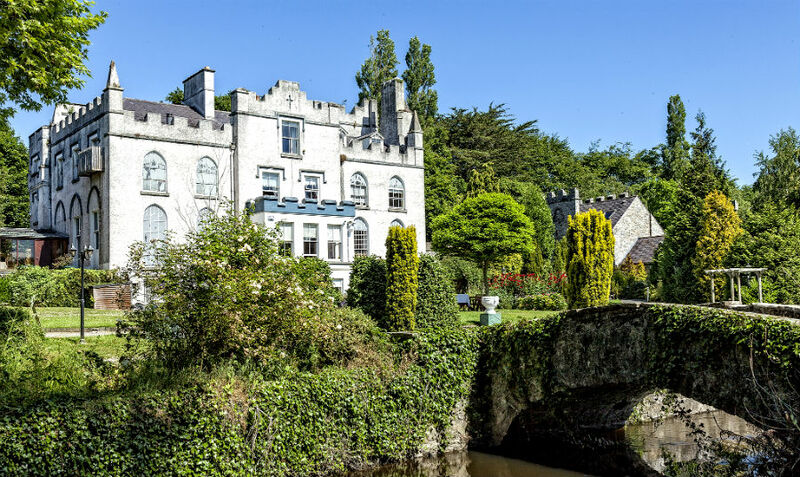 Celbridge Abbey, a gothic structure by the Liffey, was originally built by Bartholomew Van Homrigh, Lord Mayor of Dublin in 1697. King William III presented him with the gold chain still worn by holders of that office. His eldest daughter, Esther, was a close friend and correspondent of Dean Swift. Their relationship has always been a matter of conjecture but it lasted from their probable meeting at Dunstable in 1707 to Esther’s death in 1723. They saw each other in England and Ireland and corresponded frequently. In 1713 Swift was appointed Dean of St Patrick’s Cathedral in Dublin and Vanessa, as he called her, followed soon after to her family’s houses in Dublin and Celbridge. Despite their age difference of 21 years, Vanessa clearly expected that Swift would marry her. His letters to her are affectionate, and suggest more, but he did not commit to marriage. She died in 1723 at the young age of 34, most likely of tuberculosis, but some say of a broken heart following a stormy visit to Celbridge from Swift. 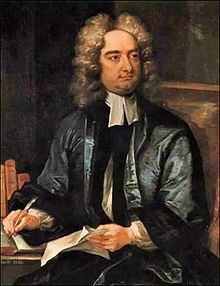 Nowhere is the heritage of 18th-century Ireland more strongly reflected than in Celbridge, linked with one of the literary giants of the period, Jonathan Swift, known worldwide for the pleasure he gave to generations through his writings, particularly the satirical ‘Gulliver's Travels’. 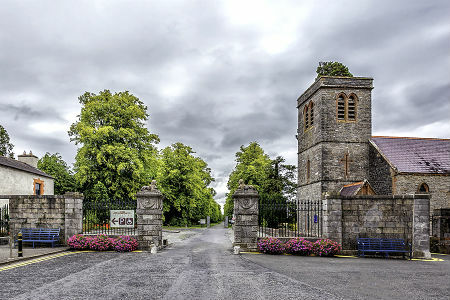 Celbridge Abbey was later owned by a grandfather of the great orator Henry Grattan, a frequent visitor to Celbridge, whose name is inextricably linked with the Parliament which led a short-lived period of Anglo-Irish independence and prosperity in the late 18th-century. The Rockbridge at Celbridge Abbey, dated 1724, has the distinction of being not only a most intriguing structure, but also the oldest remaining bridge spanning the Liffey. 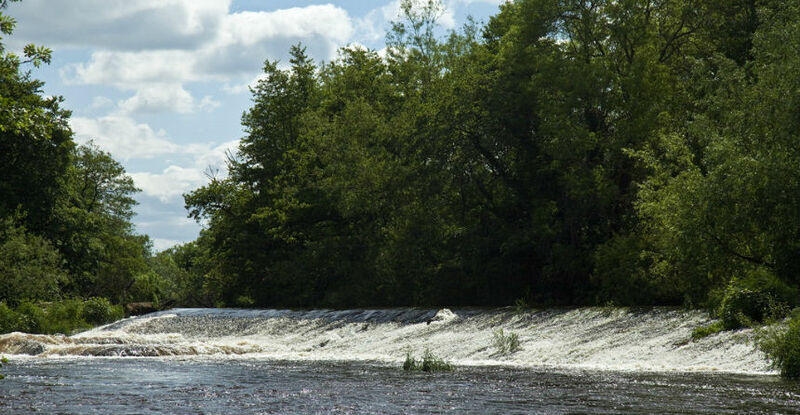 A quiet, romantic spot overlooking the weir in the Abbey grounds was chosen to be the special bower of Swift and Vanessa. To view these historic grounds, contact Breda at: 087 963 0719. There is no admission fee. Their original bower was destroyed during the construction of the wonderful Rockbridge. The bower you can see today is a modern replacement. 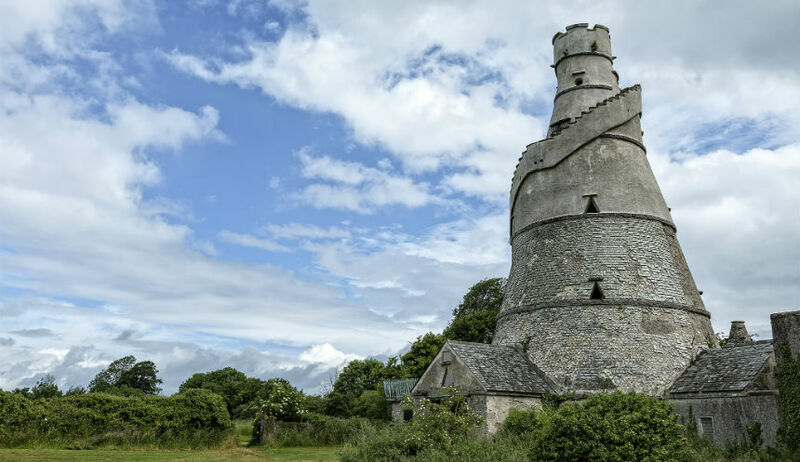 Rising above the Liffey, the imposing stone Mill presents a striking introduction to Celbridge for the visitor from Dublin. It is a physical testament to a thriving industrial heritage centuries old. Mills have been powered by the Liffey at Celbridge since 1217. Over the years Celbridge Mill has been a source of employment. Its use has adapted to changing demands, from flour and paper to linen and wool. At one time, in the early nineteenth century, it was the largest mill in Ireland, noted for hats, and later for woollen coats. It produced carpets for the well-known ‘Navan’ brand as recently as 1982. 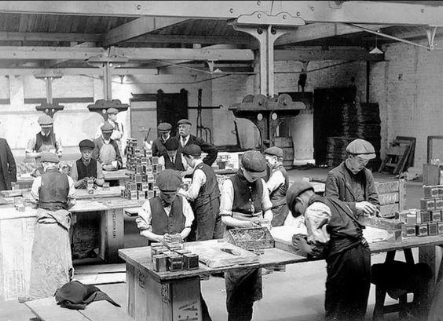 The use of local resources has been a feature of the Celbridge mill industry. Peat from local bogs was used for paper milling, and today turbines generate electricity at the Mill. 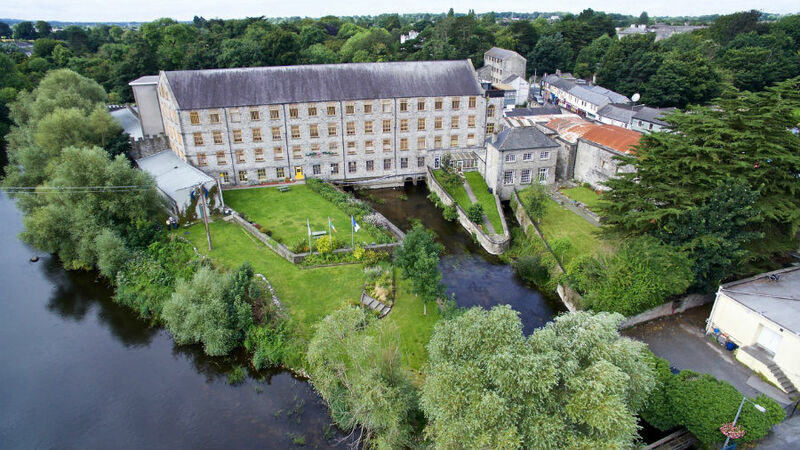 The Mill now operates as a community centre housing small businesses and recreational activities, and serving many of Celbridge’s vibrant community and voluntary groups. This fine house on the main street near the Guinness statue is the oldest residence in Celbridge, dated 1719. It was built by a Dublin upholsterer and tapestry maker, Robert Baillie, who brought Flemish weavers to Dublin. Two of their tapestries, depicting the Siege of Derry and the Battle of the Boyne, hang in the Irish House of Lords in College Green, Dublin, now the Bank of Ireland. Celbridge Guided Tours can arrange a visit to the house and its garden sloping down to the River Liffey, by appointment; telephone: 087 963 0719. Just 350 metres from Castletown gates on Big Lane/Maynooth road is an intact Workhouse building and its burial ground, a stark reminder of a dark period in Irish history, the Great Famine. When workhouse inmates died their bodies were carted to a pit in the graveyard to be buried together in unmarked graves. Possibly thousands were buried there unknown and forgotten, their names unrecorded. A cross was later erected in memory of all who died during those tragic years. 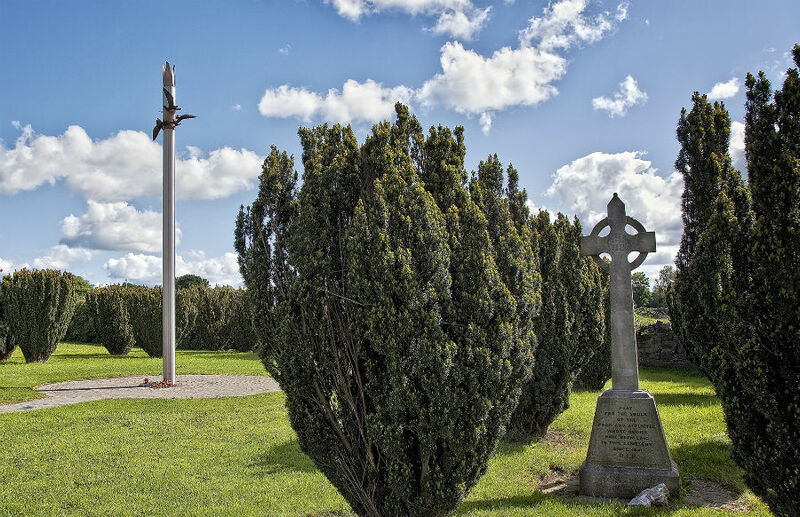 In 2007 Celbridge Tidy Towns restored the graveyard and erected a beautiful memorial sculpture. The Workhouse building on the Maynooth Road now has a much brighter role as home to Ireland's leading decorative paint brand, Colourtrend. The name Celbridge derives from the Irish Cill Droichid, meaning the church of the bridge. 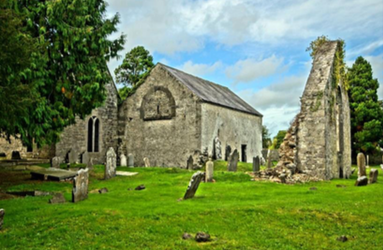 The old church and graveyard were, according to tradition, established by St Mochua around 600 AD along the Slí Mhór, one of Ireland’s ancient paths that link Dublin Bay to Galway Bay. This graveyard on Church Road, familiarly known as Tea Lane, is perhaps the earliest evidence of settlement in Celbridge, and from here our village evolved. A holy well, close to St Mochua’s Church in Tea Lane, was used by the saint to baptise people in early Christian times. 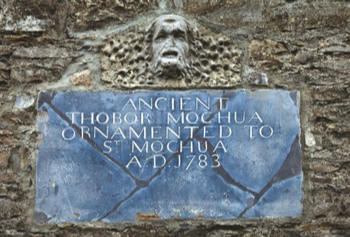 A stone carving of the saint’s head with the inscription ‘Tobar Mochua’, was found beside the well, closed over in 1783. Among the notable burials in Tea Lane graveyard are those of Henry Grattan Jr., MP. This Henry Grattan was the son of Henry Grattan, the famous politician and statesman, who campaigned for the legislative freedom that resulted in ‘Grattan’s Parliament’. The graveyard is also the burial ground of William Conolly of Castletown and his wife Katherine, both interred in the Conolly Death House. Inside the mausoleum is a magnificent white marble monument, commissioned by Katherine in memory of her husband. 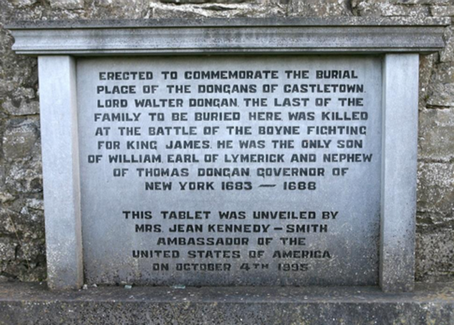 The Dongans, who lived at Castletown before the Conollys, are interred at Tea Lane. Colonel Thomas Dongan became Governor of New York State in 1683 and drafted a bill of rights which has an important bearing on the US Constitution. In recognition of this, a plaque was unveiled at Tea Lane in 1995 by the then American Ambassador to Ireland, Jean Kennedy-Smith. It is believed that workers from Yorkshire who came to Celbridge to work in the nearby mills dumped their used tea leaves along the side of the road and so the locals christened it ‘Tea Lane’ in the 19th century. Today the graveyard is in the care of Kildare County Council and the community. Visits to Tea Lane are free by appointment. Phone the key holder at: 087 9630719. The Wonderful Barn was built in 1743 by Katherine Conolly as relief work to give employment to the poor. A flight of 94 steps winds around the outside like a corkscrew. Two smaller structures of a similar design stand behind the main barn. 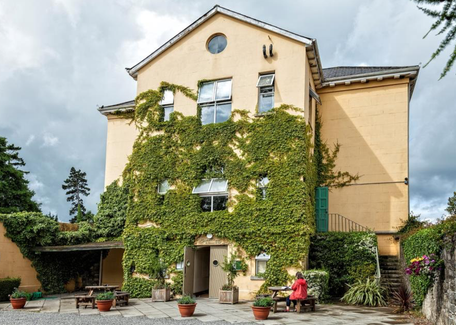 The great Irish novelist and playwright Samuel Beckett, the author of ‘Waiting for Godot’, who received the Nobel Prize for Literature in 1969, has a connection with Cooldrinagh House, now known as Beckett’s Hotel. Beckett's mother May (née Roe) was born here on March 1st, 1871. Carton House was built in 1739 for the Fitzgerald family, Earls of Kildare and, from 1766, Dukes of Leinster, the most powerful Anglo-Irish family for a long period in Irish history. Their Dublin residence, Leinster House in Kildare Street, is now the seat of Dáil Eireann, the Irish Parliament. Lord Edward Fitzgerald, a leader of the 1798 Rebellion, was born into this aristocratic family at Carton House in 1763. Having served in the American War of Independence, Lord Edward spent time in France during the revolutionary period which influenced his conversion to republican ideals. Carton demesne offers designated walking routes with wonderful views through over 1,100 acres of parkland. 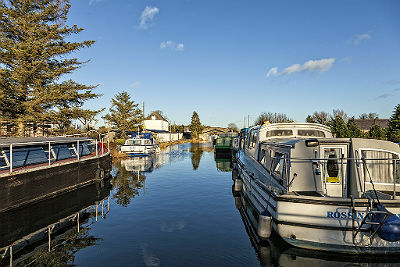 It has a very attractive man-made lake, a boathouse and a fabulous shell cottage. Walking maps are available at reception. It now contains two fine golf courses and has hosted the Irish Open Championship on a number of occasions. 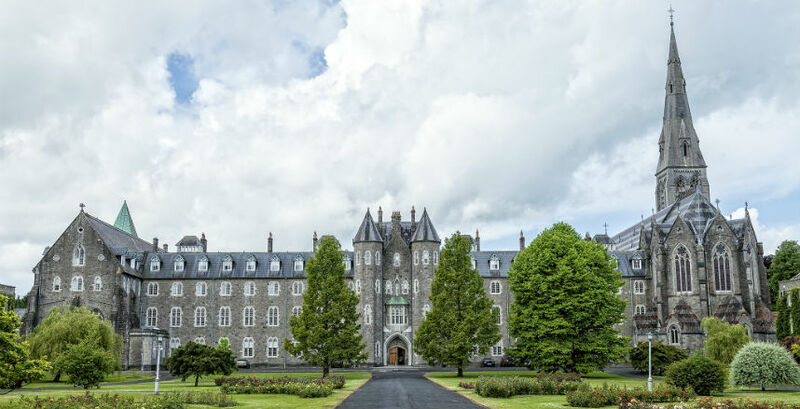 St Patrick’s College in Maynooth was established in 1795 as the Catholic national seminary. Much of the college was designed, or inspired, by A.W.N. Pugin. The Russell Library has one of the most magnificent interiors in the college and the College Chapel is beautiful. The small Science Museum can be visited by appointment. 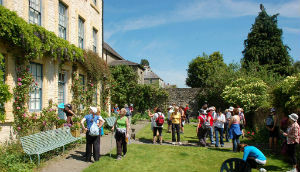 There are pleasant walks in the well-maintained grounds. The yew tree at the entrance, known as the ‘Silken Thomas Yew’, is one of the oldest native trees in Ireland. The college grounds are open all year. In recent decades the secular part of the college has developed into Maynooth University, situated mainly north of the college on a new campus. 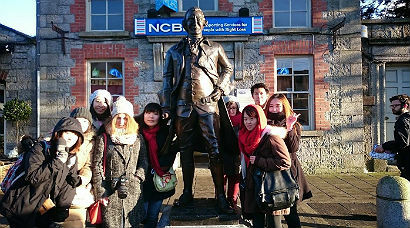 The university has become one of Ireland’s most progressive third-level institutions. 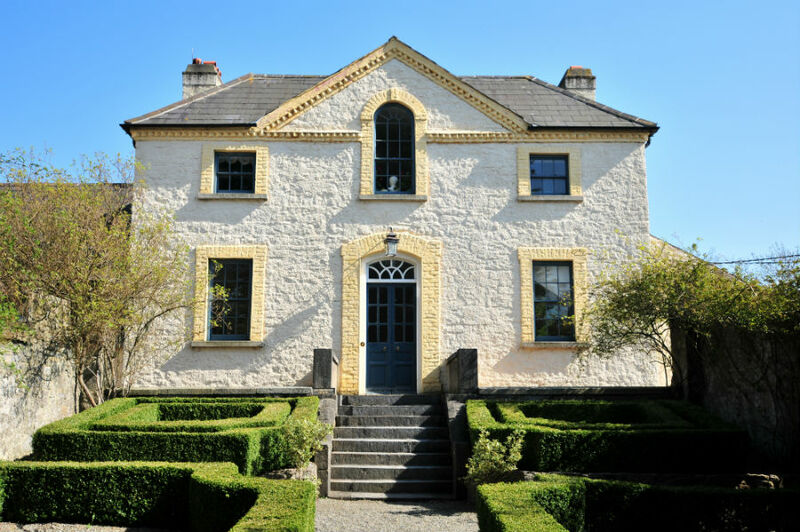 Straffan House was built in 1832 by Hugh Barton of the world-famous Barton et Guestier wine company. The design of the house was based on a magnificent château at Louveciennes not far from Versailles in France. The K Club, formerly Straffan House, is now a top-class golf resort and was the venue for the 2006 Ryder Cup. 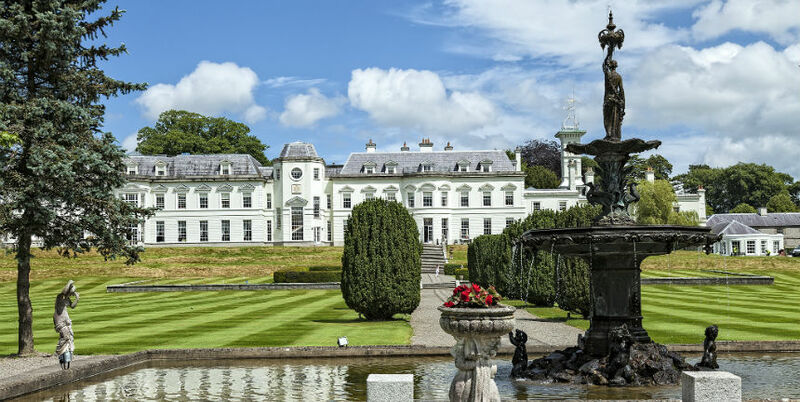 The K club comprises 500 acres of open parkland. A map highlighting a designated walking route is available at reception. Maynooth Castle, located close to the entrance of St Patrick’s College, was home to the Fitzgeralds, Earls of Kildare from the 14th century. One of the most powerful heads of the family, Gearóid Mór (1456-1513), was known as the Uncrowned King of Ireland. The growing power of the Fitzgeralds led to friction with the English monarchy resulting in the rebellion of Silken Thomas, son of the ninth Earl. 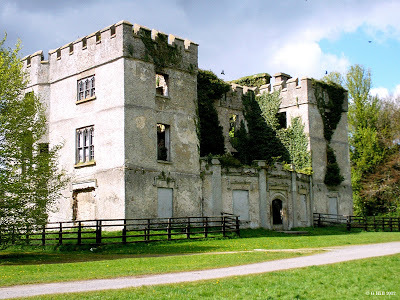 It ended with the capture of Maynooth Castle, the killing of all its occupants – which became known, ironically, as the ‘Maynooth Pardon’ - and the subsequent execution of Thomas and five uncles in London. 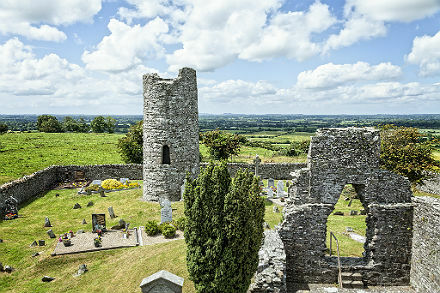 Just a few kilometres from Celbridge is another of the area’s oldest monuments, Taghadoe Round Tower, part of a monastic settlement dating back to the 6th century. 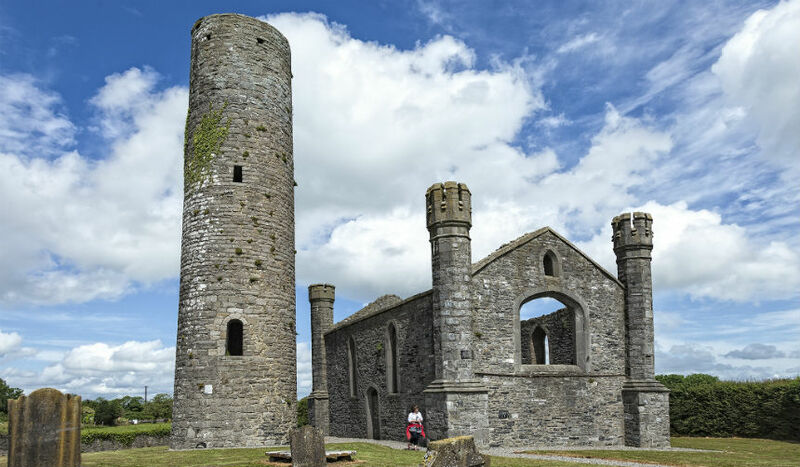 Round Towers, a striking feature of Ireland’s built heritage, are thought to have been refuges against Viking marauders, their elevated entrance enabling the monks to take shelter with their sacred possessions. Another theory is that they were bell towers. Donadea Forest Park, a National Heritage Area, comprises 243 hectares of mixed woodland with forest walks, a nature trail and a 2.3 hectare lake with a wonderful display of wildlife and water-lilies. It contains many historical features including the remains of a 17th-century castle of the Aylmer family, walled gardens, church, tower, ice house, boat house and a lime tree avenue. The park contains a playground and special activities are held for children at Christmas and Halloween.